Chia seeds so yummy! Have you ever used them? They are high in Omega’s and when they are gelled they become a wonderful gelatinous fiber, that works as an intestinal scrubber. Chia seeds also do not contain any estrogen like flax seeds. They are such a wonderful addition to your diet. The drink I am gonna tell you about I adapted from a new drink at Whole Foods, called Mamma Chia. When you drink it is kinda like drinking a runny version of jello. If you are texture funny then you might not enjoy it. They have various flavors and I have liked each one I have tried. Only problem I see is they are almost $4 for a 16 oz. So I have been on a mission to make my own. My recipe is not perfected, but I want you to start drinking it so Im gonna give you what I know now. You need chia seeds, and then your flavored base. I use a loose leaf pom green tea that I make. I am sure you can use any herbal tea. Make the tea a little strong. 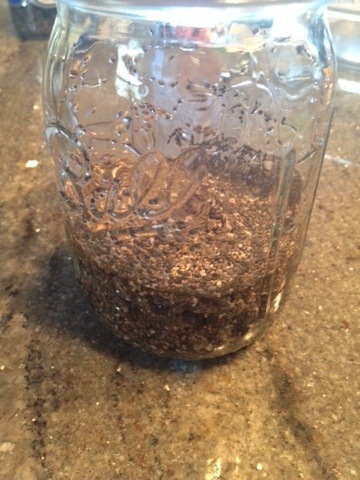 Take Chia seeds and add the water to them, stir and allow to sit about 3-4 minutes, stirring occasionally. Once you can tell they are starting to have a gel around the seed, then add your base to the rest of the glass, stir and drink. Some things I am not sure about it since I have not played enough with the drink. When you drink Mama Chia, the whole drink stays very gelatin like, so you may need more seeds. I also know that it has been bottled for a while before we would purchase, I am sure that makes a difference. I am usually drinking mine with in hours after making it. When I take it to work I make it in a used GT Kombucha glass bottle and it makes a nice addition to my day.